Railroad history is the root of our hobby. What has happened to railroads in the past as well as the history that is being made even now inspires and influences what model railroaders do. Even if we freelance a railroad, it is always based on some prototype somewhere or a mixture of prototypes. This section of Building Your Model Railroad contains a series of articles relating to the history of railroading. Hopefully, it will serve as a starting point or an early research tool to give you ideas about what type of railroad you may want to model. These articles are in no way intended to be a complete history of the railroads discussed. Each one is more like an overview to give you the flavor or the essence of the railroad, what its purpose was/is and the era in which it operated. References are given if you wish to delve deeper into each topic. The first article in the series is The Virginian Railway, one of my personal favorites, particularly since I live in Virginia and love to visit and model the Appalachian scenery. Others will appear here as they are written. I hope you will enjoy this section of the website as much as I enjoy writing about it. 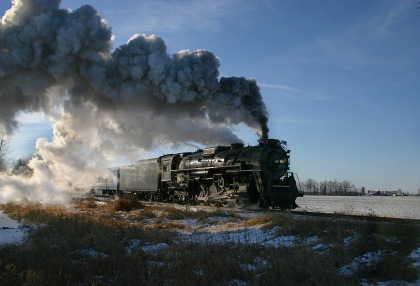 By the way, if you have any personal knowledge of railroad history that you would like to include in this section, please click here to let us know. British Railway Changing Tracks - The history of the British railway system will practically reflect the evolution of the rail transportation system. The system also reveals the impact, it experienced, of changing times and trends of the socio-economic political scenario. Railroad Parts: History for Kids - This is a great web page (for "kids" of all ages) with lots of interesting and fun links to other pages explaining the history of railroading, steam engines, locomotives, engineers, and stories about the thousands of wayfaring teens that rode the rails during the Great Depression. You don't want to miss this! From "Railroad History" to "HomePage"